Ce qui suit est une traduction à l'intention de nos amis anglophones de l'article paru le 23 octobre dernier tiré du blog de Nicole Bertin; elle a été réalisée à titre gracieux par un membre de notre association DDME. Nous l'en remercions vivement. 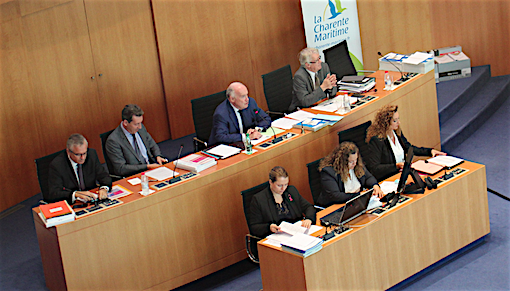 Nicole Bertin’s blog, Nicole Bertin Infos, recently published an article on the October 22 meeting of the General Council of the Charente-Maritime. We encourage our readers to subscribe to her blog, which is an excellent source of information related to the political scene, culture and economy of the Charente-Maritime. She has been ‘front row and centre’ concerning the situation which most worries members of the DDME and which we are battling with all our forces: the EDF-R wind farm project along the right bank of the estuary of the Gironde. Addressing his colleagues assembled at La Rochelle, Dominique Bussereau reminded them of his opposition to the surge of wind farm projects in the Charente-Maritime. He is concerned that they will lead to the destruction of the regional landscape. Inspired by what Regional President Xavier Bertrand has done in the Hauts-de-France, Bussereau has launched a Wind Farm Watchdog Group (L’Observatoire de l’éolien) for the Charente-Maritime. Its mission is to inventory the numerous projects, inform the public, seek help if necessary, and, above all, “prevent what’s unacceptable.” He is backed in his battle by Regio Councillors Lionel Quillet (L’Ile de Ré), Marie-Pierre and Didier Quentin (Royan), Françoise de Roffignac (Cozes), Loïc Girard (Gémozac), Marie-Christine Bureau and Bernard Louis Joseph (Mirambeau and Pons), among others. Dominique Bussereau was quick to reply. This watchdog group is being established to inform the public regarding wind farm projects underway, which are often hidden by certain ‘swindlers’ who have managed to convince both farmers and mayors via the cold, jingling sound of money. “We have reached a threshold in the Charente-Maritime.” President Bussereau went even further, saying, “these wind farm projects are sounding the death knoll for the development of tourism.” He added that, in France, we have not figured out how to dispose of these wind turbines once they’ve reached the end of their life cycle, and that the sand used to produce the tons of concrete necessary to anchor the turbines in the ground would need to be dredged off the coast of Mathes. Sharing this position are Loïc Girard and Dominique Marion, Director of the Ferme de la Gravelle [an organic farm and campsite] in Mortagne. Forty years ago, he fought against the building of the nuclear power plant at Braud-et-Saint-Louis; today he is fighting the wind farm project along the estuary. Alongside environmentalists, numerous local players are also opposed, first and foremost the hunters. Is the project destined to fail? Many are hopeful this is the case, as the estuary of the Gironde is a sanctuary and important stopping ground for migratory birds; an ecosystem that continues to be passionately studied by Raphaël Musseau, a graduate of the École Pratique des Hautes Etudes in Paris, and today Director of BioSphère Environnement in Mortagne.